As infamous as the Asylums themselves, the Padded Cell was an essential piece of equipment within the wards. They were a special room and it was not intended that patients were housed in them for long periods of time; it was used so that patients did not harm themselves when suffering from an epileptic or psychotic episode. Suicidal and violent patients were also placed within them. Padded cells rose in use when Dr John Conolly, the Third Medical Superintendent at Hanwell Asylum, set about abolishing the use of mechanical restraint to control the patients within the Hanwell Hospital when he was elected the in-house physician in 1839. This was the first time that the idea had been implemented on a large scale; the Lincoln & the York Retreat were the first to use the idea – however it met stiff resistance within the mental health community, but it eventually led to abolishment of mechanical restraint in other hospitals. By using a system of therapy, seclusion (including padded cells), confinement and some sedatives Conolly was able to effectively control patients within the Hanwell Hospital. The only restraint used was ‘heavy clothing’ but this was to prevent patients from tearing their clothes of breaking crockery. With these ideas, the Lunacy commission adopted the ideas and implemented them around the country. Pictured is the padded cell at Stanley Royd Hospital, which was last used in 1959 and removed in 1963. An account from a visit to St Francis Hospital by a reporter from the Brighton Gazette on the 1st of August, 1861 describes the padded cell. “One small door was unlocked, and we looked in, not upon a patient, but upon an empty room, a room we had heard of as part of such a building, – the padded room, – thickly covered all around and on the floor with padded cloth, a sure preventative of self-mischief from even the most violent. And this was untenuated, and more than this it was seldom used we were told. 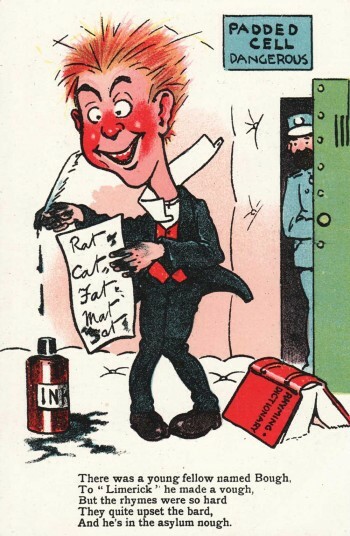 ” Taken from Sweet Bells Jangled Out of Tune – James Gardener – ISBN 0-9536101-0-1. The construction of the Padded Cell was simple, it was a normal seclusion room that had been modified to allow the fitment of a double locking door and padded walls. The padded walls them selves were made of leather pouches, or canvas, that were then stuffed with horses hair and painted; this provided a very durable but firm padding. 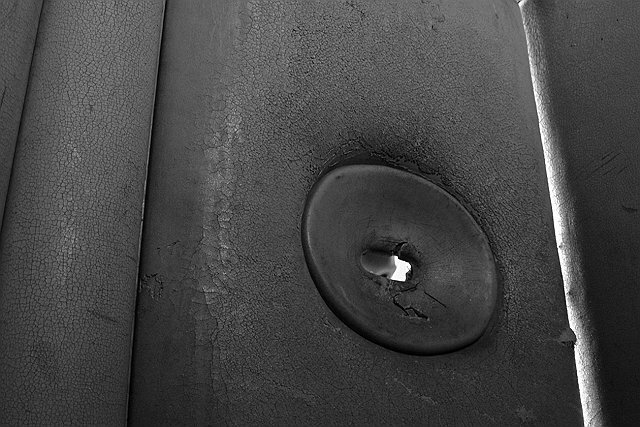 Often the panels would become ripped by patients, if this was to occur they would be sent to the in house upholsterer for repair, whereby they would be recovered and painted. 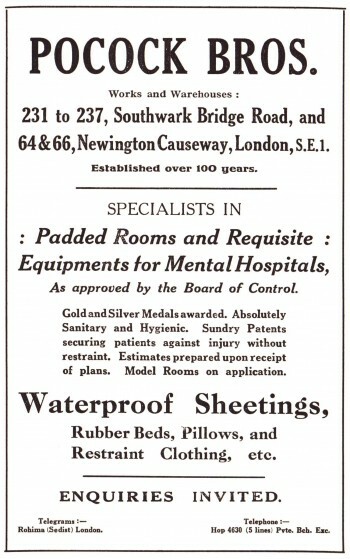 One such manufacturer, and installer, the Pocock Brothers advertised their padded rooms. 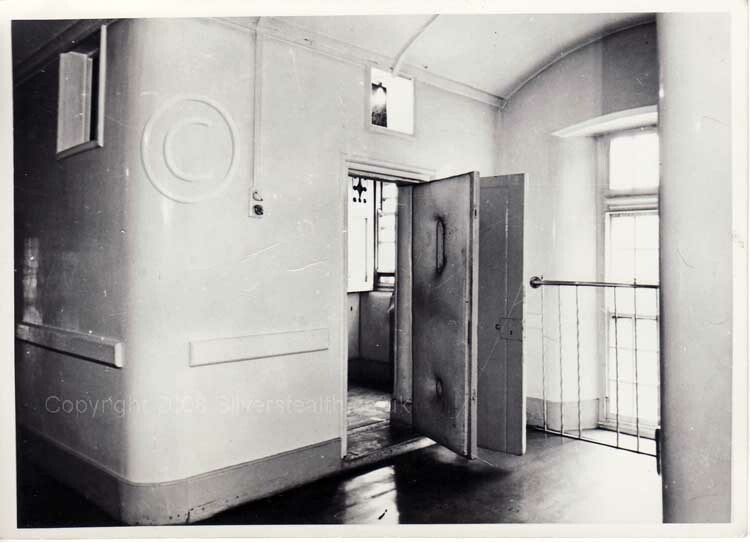 The more modern padded rooms that have been found at Harperbury Colony were made from foam and plastic; this provided a very soft room in which epileptic patients could be placed whilst they suffered a seizure. A large Asylum, Such as Horton in Epsom had 28 full and half padded cells installed through out the buildings, this is approximately one cell ward. 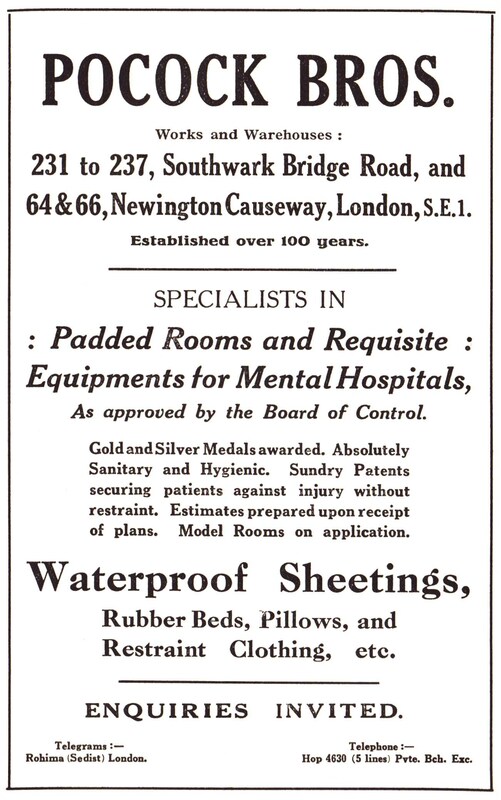 With the introduction of new psychiatric treatments, sedatives and medical procedures the padded cell became a redundant tool in the mental health profession. Their withdrawal started after World War Two, along with the shift in the treatment of patients – Whitecroft Hospital had theirs removed as late as the 1980s. 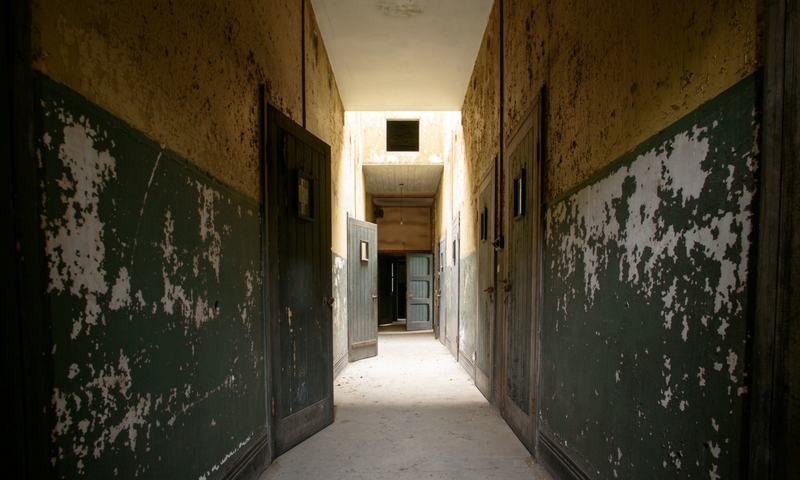 In speaking with former staff from Claybury Hospital, the recounted how a small number of the padded cells (or paddeds as they referred to them) were retained within the hospital, and were re-employed for ne uses. TheTimeChamber was told how they had a blind dementia patient who lived within a half padded cell because it was the safest place for here to be left alone without supervision. There is only one padded cell that remains in situ and that is at West Park Hospital, Epsom, although it is in a very bad state of repair; another example is the Stanley Royd Museum.